Will Jimmy Walker Continue to Putt at an Elite Level? I got some push-back from Chris Catena on twitter today about my contention that Jimmy Walker’s recent run of great play was driven by lucky putting. In that post, I showed that Walker had established himself recently as an above-average, but not elite putter (a strokes gained putting of around +0.25-0.30/round for the last five years). During Walker’s recent run (Frys.com Open through Northern Trust Open), he’s putted at a +1.20 level. That +0.9 strokes/round improvement is entirely what carried him to three wins in the last four months. I also contended that Walker continuing to putt at this level is very unlikely, simply because no one ever has for a full-season. Moreover, Walker’s best putting season (+0.46) and average putting season (+0.26 from 2009-2013) are far short of the kind of elite, sustained level of play we often see out of the golfers who lead the Tour in strokes gained putting. This post is to defend those claims in more depth and show why I think it’s very unlikely that Jimmy Walker will continue putting and playing as well as he has in the last four months. Above is a graph of Walker’s strokes gained putting performance per tournament in every tournament the PGA Tour has data for since the start of 2012. The red dashed line is a linear trendline of his performance. It has basically zero (R=0.03) relationship with the passage of time, indicating that on the whole, Walker’s performance hasn’t improved over time. This is important to note because if we hypothesize that Walker changed something in his ability to putt, it clicked in only weeks after his worst putting stretch of the past 2+ years. Now, poor performance is certainly a motivator to change and try to improve, but a simpler explanation is that Walker got unlucky during the summer, and has been riding a combination of luck and improved putting since. What Walker has done in the past 23 rounds on Tour isn’t unprecedented even during the 2013 season. I divided the tournaments in 2013 (Hyundai ToC to Tour Championship) into four quartiles with 7-8 tournaments in each quartile. I then found the golfers who had participated in 4+ tournaments in each bucket and averaged their SGP for each quartile. I gathered all golfers who had qualifying consecutive quartiles and compared them using Q1->Q2, Q2-Q3, etc. 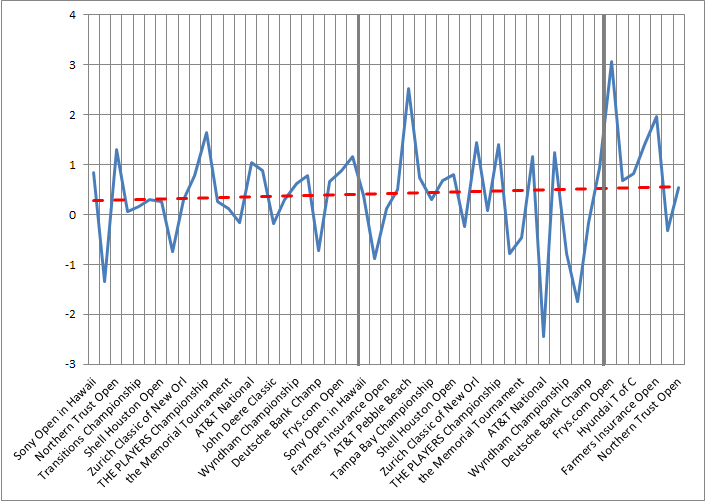 For Q4, I compared it to performance so far in 2013-14 from the Frys.com Open to the Northern Trust Open. From all that, I had 365 pairs of quartiles where a golfer had played at least four tournaments during each quartile. A graph of of those pairs is follows. There was very little relationship between a golfer’s performance in one set of tournaments and their performance in the following set of tournaments (R=0.04, indicating a tenuous at best relationship). I had 61 quartiles with a performance > +0.50, averaging 0.72. Those quartiles played to only +0.12 in the next set of tournaments. In fact, in only 12 of those samples of > +0.50 performance did a golfer again average > +0.50 the next quartile. 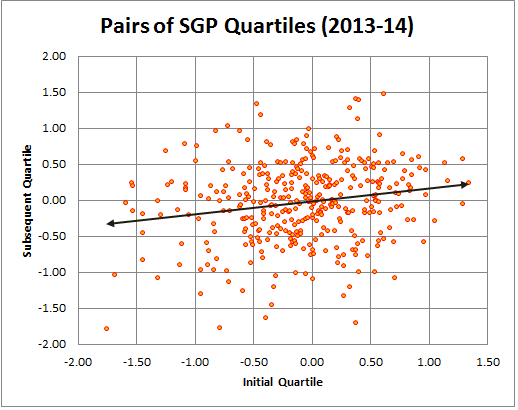 None of the six samples of > +1.00 SGP had > +0.52 SGP in the following quartile. In short, we should be very skeptical of elite putting performances over fairly short periods of time. Now, when I said that Jimmy Walker’s performance was largely driven by luck I meant the “largely” part. I think it’s extremely unlikely that all of his putting performance can be explained by variance alone. Jimmy Walker has +1.20 strokes gained putting/round in 23 measured rounds so far this season. The observed standard deviation between 23 round samples for PGA Tour players is around 0.35 strokes. That means if an average (+0.00) putter plays an infinite number of 23 round samples, 68% of them will yield an SGP average of -0.35 to +0.35, while 95% of them will yield an SGP average of -0.70 to +0.70. In short, there’s a ton of variation between 23 round samples. For an average golfer, it wouldn’t be shocking for them to putt extremely poorly or very well over 23 rounds. Plugging that standard deviation (0.35), Walker’s 2013-14 SGP (+1.20) and Walker’s five year SGP average (+0.26) into a Z-score equation yields a Z of 2.7 which indicates <1% chance that Walker’s SGP is entirely due to chance. That means there is some signal in all that noise. But how much? I consider myself a Bayesian in that I think it’s very important to compare any observed performance to our prior expectation for that performance. Up until October 2013, Jimmy Walker was an above-average, but not elite putter. Since then, in 23 rounds, Walker has putted out of his mind. Surely we should consider Walker a better putter than we did in October, but how much better? Fortunately, there’s a simple equation we can use to estimate how the 23 round sample should change our expectation for him. It’s ((Prior Performance)/(Prior variance) + (Sample performance)/(Sample variance))/((1/Prior variance)+(1/Sample variance)). Basically, this equation tells us how confident, statistically, we should be about a golfer establishing a new level of performance based on how far his performance is from the prior expectation and how large of a sample we’re dealing with. We know the prior performance and sample performance from the previous paragraph. The sample variance is simply the 23 round standard deviation from above (0.35) squared (0.12). To find the prior variance, I was forced to run some simulations as my data was limited. I know the variance for 100 round sample is around 0.025, so the prior variance for Walker over his >300 rounds in 2009-2013 must be no greater than that. Simulations indicated to use a figure around 0.02. Plugging those values into the equation yielded a new expectation for Walker of around +0.40. That’s significantly higher than his five year average, but also much less than what he’s done recently. The equation is saying that Walker’s been much better, but that 23 rounds isn’t nearly enough to say that he should be expected to continue to putt at an elite level. If we had just seen Walker putt at a +1.20 SGP level for 80 rounds, we’d be much more confident in him continuing to putt at an elite level. The tl;dr here is that extremely good SGP performances over small samples (~4-8 tournaments) sharply regress to the mean in the following 4-8 tournaments. Sustaining the kind of putting Walker has shown recently is unprecedented over a large sample of rounds from 2013-14. Moreover, the expected level of variance of 23 rounds is very large. It would not be abnormal for an average putter to putt at a top 20 or bottom 20 level over 23 rounds. Considering all that, we should expect Walker to putt better over the rest of the season than he did in 2009-2013, but not nearly as well as he has since October.